Registration for Baltimore “Bikes Rule at School” Week now open! This May, we’re not just taking a day to Bike to School — we’re celebrating a whole week of how … Continue reading Registration for Baltimore “Bikes Rule at School” Week now open! 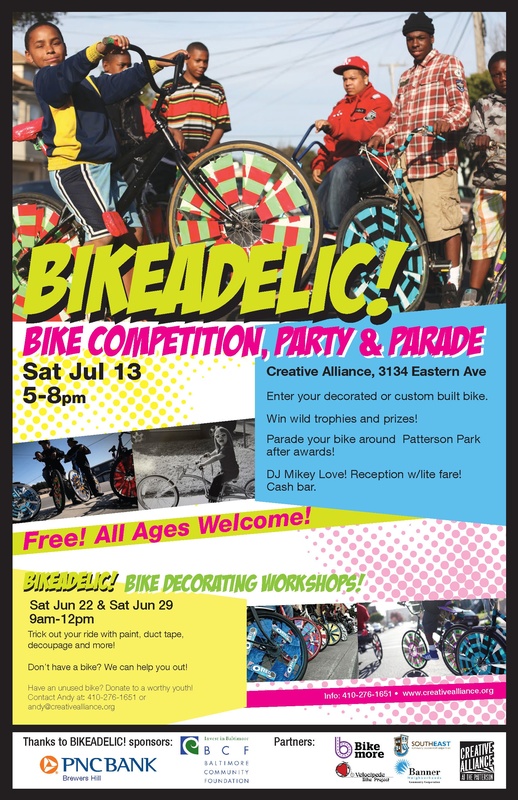 Bicycle Revolution Workshops and Bikeadelic Party & Parade! Learn more and RSVP on Facebook! June 22 & June 29, 9-12pm Free! Customize your bike with paint, special duct tape, decoupage designs and more! Get ready to win fun prizes at BIKEADELIC! Taught by MICA Community Arts MFA candidates Andy Dahl and Michelle Nugent. Bring your bicycles. Materials provided. En espanol and English. Bikeadelic Youth Bike Decorating Party, Contest & Parade! Those who decorated bikes on June 22 and 29 will have the chance to show them off to an enthusiastic crowd and win awesome prizes! Group ride in Patterson Park to follow. Sponsored by Creative Alliance and Bikemore with significant assistance from Baltimore Bike Party, Digital Harbor Bike Club, Communities for All Ages, Banner Neighborhoods, Velocipede Bike Project, and Light Street Cycles. Happy New Year from the Baltimore Family Bike Party! We are taking a short break from our regular rides in January and February with plans to start riding monthly again in … Continue reading Happy New Year from the Baltimore Family Bike Party!